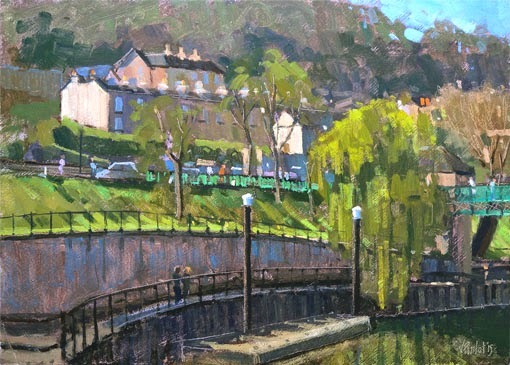 Here is a plein air painting I did a couple of weeks ago in Widcombe alongside the river Avon. 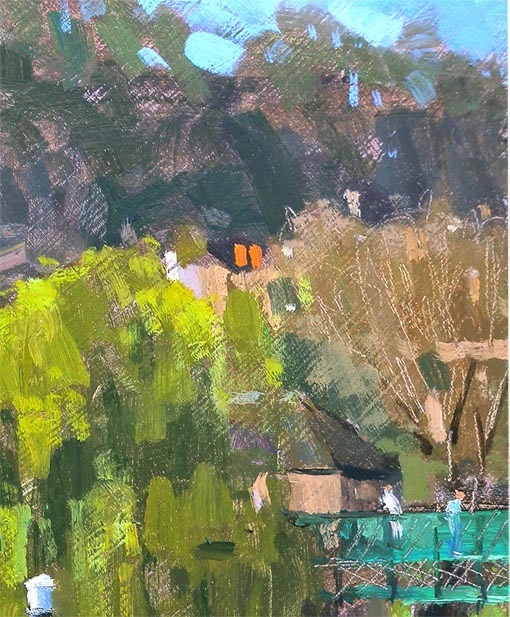 My discerning blog followers might notice I did a painting almost at the same spot last year, depicting the footbridge (you can see a small section of it on the right). 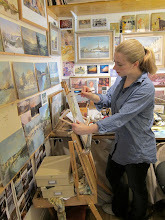 Click here to see which painting I'm talking about. 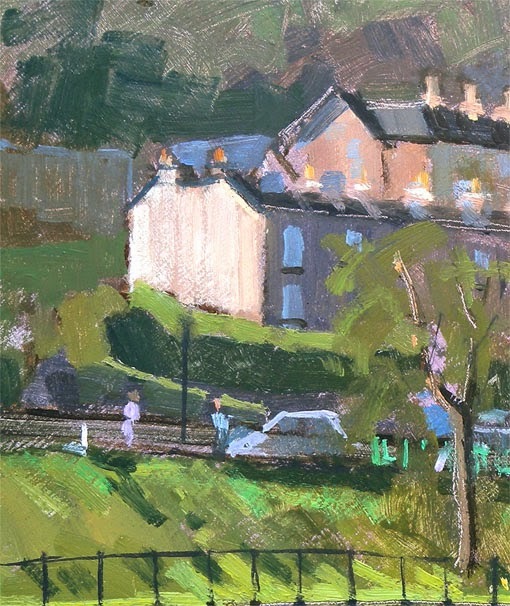 It was a beautiful sunny morning and what caught my eye was the variety of greens, the sun hitting the facades of the houses, and the green footbridge/roadworks fences caught in the sun. 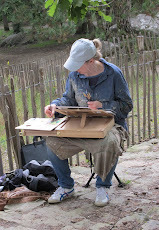 Below is the picture of the view I painted. 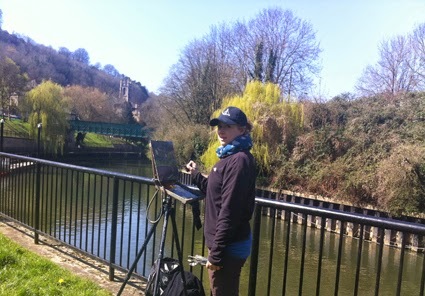 I set up alongside the river handrail and tried not to drop my brushes in the water (almost did!). I didn't need to look at my watch to keep track of time because I could hear every 45 minutes the guide on the microphone in the tourist boat passing just below me, saying each time exactly the same sentence at the same spot. I got a few waves from the tourists too so that kept me company. This painting, alongside many others, will be for sale at our forthcoming show in Bradford on Avon on 2-4 May. If you haven't heard about it and want more info, check out my last blog post here. I hope to see you there! This is a lovely painting, you've really caught that early spring light and the freshness of a willow newly in leaf. I like your newer one by the river in Bradford too for similar reasons; you've caught that time of year when some things are greening up and people are beginning to be out and about. Best of luck with the show, I hope it goes very well. Thank you Evie for your comment! That's exactly the feeling I wanted to convey in the painting so glad I succeeded. Thanks for the good wishes for the show. I hope your painting is going well. Absolutely love this, you've captured the colours and feel of the day so exquisitely. Thank you very much! Very kind comment! Thank you so much for this informative article post.